Is a chainsaw Stihl tough after you put it inside a purse? I tried a few different methods of adapting some sort of shoulder strap to our chainsaw and none of them felt balanced enough to be practical. The above 20 dollar chainsaw purse is a good solution that comes with its own shoulder strap. 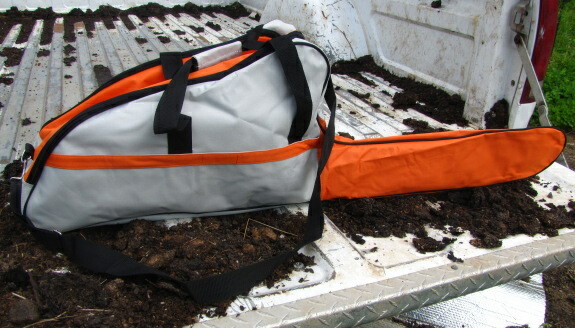 It's made of some heavy material with a hard bottom and a side pouch for small tools. I found this one on Ebay from the seller who goes by "Ed's Small Engine Barn" out of Columbia Kentucky. Yes..... I'd say there's enough room left over inside to fit a small 1 gallon fuel container. Funny! And handy. You're the only guy who got a new purse for Easter. It's tough enough. Just don't paint any flowers on it. Everett --- What a great idea! I'll sneak out in the middle of the night and paint pink flowers on it! I purchased the depicted item off of e-bay. Be warned, it is of very poor quality. The material it relatively light weight, the zipper is cheap, and my chainsaw did not fit into the bag of recommended size. The bar pocket is too tight and the body area is too short. With my Stihl chainsaw tucked into it, the zipper will not close. Frankly, I would suggest spending the extra 20 bucks to get a better quality product.